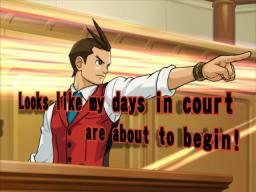 Ace Attorney fans, Apollo Justice appears in court tomorrow - GameSpotting! The newest title in the Ace Attorney series (the series used to be called Phoenix Wright: Ace Attorney) appears in stores tomorrow. The new game will not feature Phoenix as the main character, instead you will play a new attorney called Apollo Justice. The game takes place about 7 years from when Phoenix lost his job because he displayed false evidence during a case. But don’t dismay, Phoenix isn’t gone from the game, he’s who you have to defend in a murder case. He looks completely different then what gamers will remember of him. Phoenix states that he now works as at a bar as a piano player, and an ace poker player. This is the first game to be on the DS originally instead of being on the GBA and then ported to the DS for American release. The game is something to look forward to for both new and experienced gamers of the series. Apollo Justice: Ace Attorney appears in stores tomorrow. If you are unsure about the game, Capcom has put up a playable demo for you to try out.